Blandness and kitsch are the Scylla and Charybdis between which any attempt at an innovative Bible design must navigate. You can drop text into double columns, print on thin, white paper, and slap a plain black cover on, and you're guaranteed to have something that looks the part, in the way a bunch of groomsmen in rented tuxes do. They don't look great, but you know what they're supposed to be. Or, you can throw restraint to the wind and offer a line-up of crazy looks that look better suited to Mardi Gras than the typical church service. The tuxes still look rented, but they're pink with ruffled shirts. To me, neither option is particularly satisfying. I want to see some design sense applied to the Good Book, but that doesn't mean I want to jettison all sense of aesthetic taste. Which is why, nearly a decade later, I'm still impressed with the Pocket Canon. 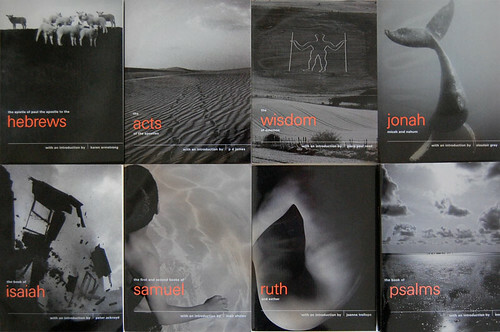 These slipcased sets, published in two series by Grove Press in the US and Canongate in the UK, each feature an assortment of books from the Bible. The text is from the King James Version, set in a readable single column with poetry set in verse. 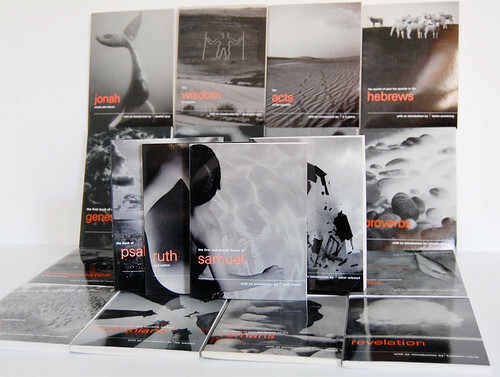 The introductions, which helped garner a lot of press for the project at the time, are by writers and artists like E. L. Doctorow, Doris Lessing, Barry Hannah, P. D. James, Ruth Rendell -- and, of course, Bono. "They're called "Pocket Canons," and they're priced at $2.95 apiece. Each one has a celebrity introduction (by E.L. Doctorow, Charles Frazier, Doris Lessing, Kathleen Norris and Bono, among others), followed by the King James text, from which not a single thy, thou or thine has been omitted. They're slimmer than a Palm Pilot, and not much bigger all around. In England, where nearly a million copies have sold, the fundamentalist Christian set is already screaming bloody sacrilege. One can only imagine how their New World brethren will react as the American edition hits bookstores -- 24 shopping days shy of Christmas -- on Dec. 1, 1999. "Probably it won't make much difference what they say: Even the planned first printing of 600,000 should be enough to put a Canon in the pocket of every post-ironic street cynic from Manhattan to San Francisco. Lauren has me thinking -- now she says she wants to trade me my Gospel for a drink, which she points out is twice as expensive -- that the fundamentalists should be nothing short of terrified. The most radical approach since Gutenberg: If infidels like Lauren start reading the Bible, if this Jesus character catches on the way that, say, Harry Potter has, mankind's greatest work of literature -- the cornerstone of Western culture and of Judeo-Christian morality -- may just be freed from the hands of bigotry before Patrick Buchanan manages to shut the library doors for good." "Packaging a Bible to fit the churchgoer sensibility is like preaching to the converted. More crucial, translations into a familiar vernacular make Jesus sound like the idiot savant pseudo-Messiah he almost certainly was and lend God all the apparent moral authority of, say, Rudolph Giuliani. Biblical stories simply don't work when the players are mortal, life-size, familiar. Told in remedial English, the miraculous sounds inane." 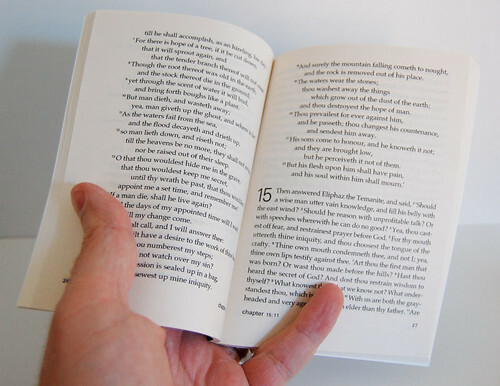 By approaching the Bible as a literary masterpiece and its form as a design challenge, the Pocket Canon team was miles from bland -- but miles from kitsch, too. The staid old bonded leather tragedies that were the market staple back then reflected an attempt to "package a Bible to fit the churchgoer sensibility"; but today's obnoxious, inelegant incongruities are, too. But I'll leave the cultural criticism for another time. What I see when I look at the Pocket Canon design is an attempt to approach a vastly important text by means of a thoroughly modern idiom. In addition to that, unlike so many settings of Scripture, they look as if they're meant to be read. The Pocket Canons always put me in mind of Penguin 60s and 70s, the bite-sized booklets featuring fiction and nonfiction that the granddaddy of the paperback released as a commemorative. Reading the book of Hebrews? 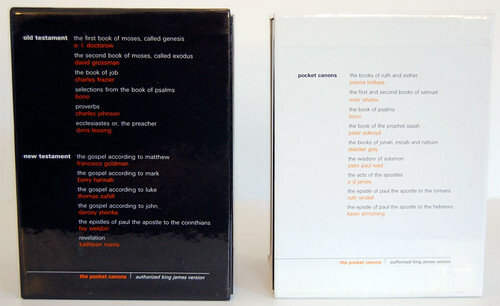 Instead of toting around a full-size Bible, or a tiny one with the text compressed to microdot proportions, you can pull the Pocket Canon edition out of the slipcase, skim over Karen Armstrong's introduction (or skip it entirely) and dive right in. It's such a convenient way to read through the Bible that I'm surprised it hasn't caught on. The introductions are the sticking point, I imagine, for some Christians. In the Salon review, Keats makes a big deal about the fact that Charles Johnson, who writes the introduction to Proverbs, is a Buddhist. But I appreciate the fact that authors from a variety of perspectives were asked to interact with the Bible, to take it seriously -- and even to keep in separate in their minds from the image in their minds of Christians today. The last thing I'd want is for the Bible only to be discussed and written about by Christians. Plus, how many readers are gullible enough to take everything they might read in an introduction as Gospel? I've been pleasantly surprised by the quality of the introductions, particularly Barry Hannah's intro to the Gospel of Mark. "The message of Mark is heartening to bad Christians such as myself," he writes. So much so that it inspires him to compose a poem. 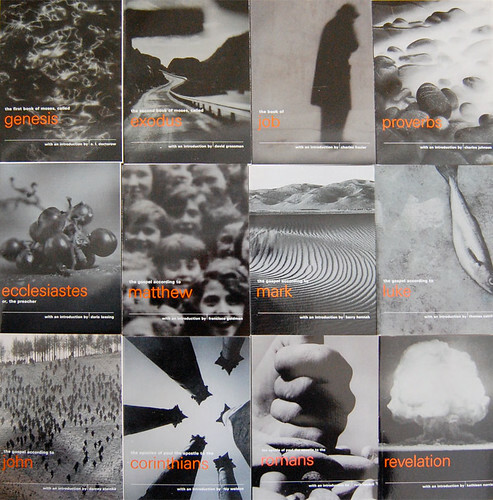 A few years after they appeared on the market, once the initial furor died down, I found a cache of Pocket Canons in the remainder stacks at Half Price Books, including the Song of Solomon (intro by A. S. Byatt) and twenty copies of Ecclesiastes (Doris Lessing). An idea formed in my mind. 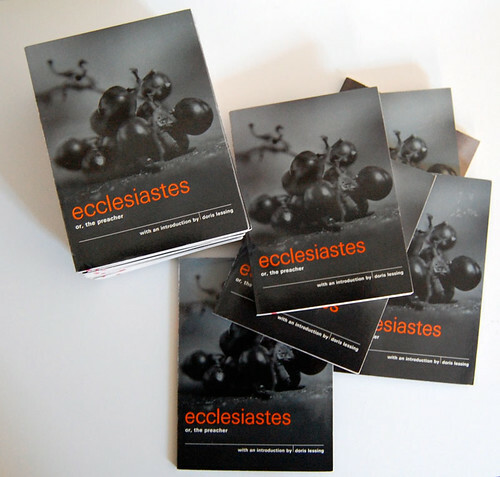 Why not teach a study of Ecclesiastes, which has always been a favorite of mine, and hand the booklets out to the students? The cashier gave me an odd look as I snapped up so many copies of the same title, but I was too excited to care. In the end, the study never came to fruition. But who knows? Perhaps it will some day. When it does, I'll be ready. 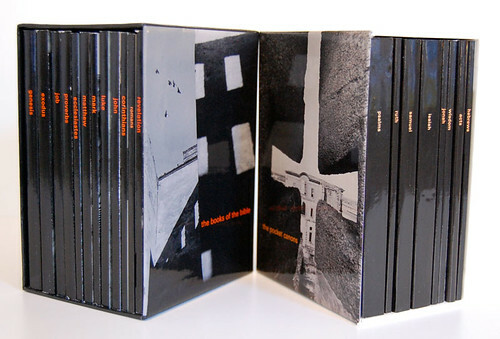 At first, what draws your attention is the covers. Then you check out all the luminaries who contributed introductions. The novelty wears off, though, and the aesthetic blends. You don't notice it so much; but you notice how unappealing other, more expensive projects are in comparison. What stays with you is all inside. Once you open the booklet, you encounter the King James text in a way many people never do. In its paragraphed form, it reads in a way it never does in the two-column, verse-by-verse settings so many of us grew up with. The difficulty diminishes and rich cadences emerge. Reading becomes a pleasure. For me, the Pocket Canon has become a touchstone both for design and readability. There is nothing technically challenging about the form. They're just inexpensive paperbacks. Compared to a hot pink synthetic leather cover with faux ostrich trim, they don't represent much of a financial investment for the publisher. But they clearly deliver more benefit. What would you prefer? Good design brought to bear on an inexpensive format, or a truly tasteless splurge. We have plenty of examples of the latter. The Pocket Canon points to a different path.